This is a work in progress so it’ll be updated as more people ask questions and additions are made to existing questions. LAST UPDATED: SUNDAY, OCTOBER 28, 2012. Check the update/change log here. How do I maintain profit? My funds keep going into the negatives! How do I build over water? How do I raise the total Yield? How do I get more residents? How many combos are there? How many Crafts are there? How do I get the White Horse? How do I get the Car? How do I unlock the Elekiter Shop? How do I unlock [ name of facility/environmental object ]? How do I unlock new Crafts? How many travellers are there and how do I unlock them? How come some people aren’t working? They just constantly hang around the Park/whine about having no money! How many types of homes are there? Why should I care about what type of house a resident lives in? Why are none of my residents remodeling their houses anymore? The distance of the Castle and Wholesalers AND shops. Are you making certain every resident can actually reach the places they need to go? You may need to build a stable that’s close enough to them so they could purchase a horse to get farther. Pay attention to those that are consistently crying about having no money and constantly going to a park. Those are signs that their workplace is too far. Too many buildings too fast. Yeah, you can up commodity prices and Yield with combo stacking but you may want to make sure you can AFFORD to keep all those buildings. Most of the more expensive ones have higher maintenance fees. Residents not upgrading homes. You WANT them to remodel because the better the home, the higher the property taxes. Upgrading will occur once a resident acquires enough money to do so. Specific roadways are also required for certain upgrades. Information about this can be found further down in this FAQ. Keeping residents on the same jobs forever/having too many residents on low-income jobs. You WANT them to be become Vassals so get them to master all their jobs as quickly as you can. However, do ensure that there’s a balance of professions too. The Merchants are the money-makers. Warriors get research points and Yield quickly. The Vassals seem to be like a mix of the Merchants and Warriors. Don’t ignore Artisans though since they discover/invent crafts which also contribute to Yield once you start levelling the items. And as mentioned in the previous point, residents will remodel their homes once they have enough money. Keeping them on certain jobs may prevent them from doing so as they will not be earning enough to meet the upgrade requirement. You can’t. You have to use the Remove option from the Env menu under Build to get rid of the water (re: Pond) tiles. However, doing this can be very costly early in the game as removing water costs 400G per tile. Creating stack/chain combos is imperative in this game; that is, arranging structures in a way that combos overlap. The area of effect of a combo is rather large (about 5 x 5 squares, I think?) so it’s rather easy have a single store with at least 6 – 8 combos on it. One of the best strategies is to combo around structures with a high Base Yield like a Castle or Sumo Ring. The Castle has an added bonus in that it will also raise the Yield of the structures around it. That’s a setup I used in my most recent playthrough. It nets you: Snack, Sweet, Plum, Kamakura, Lunch, Noodle, Refresh, Cart, Medicine, Jizo, Rice, Mountain, Hangover, Study, Hairpin, Archive, Beauty, Fried, Edomae, and Healthy. That’s 20. I’m sure you can do more, but that’s what I got in the space I had. Now that I’ve played through I’m going to work on some layouts in a spreadsheet app to see how much further I can go. Crafting is also a good source of Yield when you have research points to spare. In fact, if you’re low on funds and waiting for the next ranking or tax pool to come in, you can spend that time levelling up some crafts. However, it’s only recommended that you use this method if you know you can make back the research points quickly or else you’ll end up waiting for points even though you have the money to research and build things. The intial level of a craft always gives the highest amount of Yield. Subsequent level ups produce a drastically reduced amount. Still, don’t dismiss the tinier amounts since every little bit counts. Tree and plants also contribute to Yield so don’t necessarily count them out when it comes to building up your total. I’m not sure anyone knows a sure-fire recipe to get residents to move in quickly. It’s most likely based on the rank of the town in the national rankings as well as total yield. The number of combos and/or buildings may be a factor as well. There are a total of 46 combos. See full list here. It’s not 100% certain if the Import combo or just the Elekiter is needed near the Stables, but it seems like the chances of residents obtaining a car increases with the Import combo. Best thing to do is just place the combo right next to the Stables or as close as possible to it. It should be noted that even though you’ve placed the structure or combo near the Stables, it may take a few years before anyone buys a car. At the present moment, we don’t have a list of unlock conditions for stores and plants. However, typical unlock conditions include reseaching and placing new buildings on the map, increasing your town’s rank in the national ranking, and increasing your total yield. The number of residents you have in your town may also play a part. See complete list of buildings and environmental objects here. This building will unlock once your total Yield reaches 150,000. Place Wholesalers near stores. As I’m unsure how far it “detects” facilities, it’s recommended that you experiment a bit and perhaps place a Wholesaler near each new combo you create which involves facilities you previously haven’t placed on the map before. Note that the game will inform you that a new traveller has been added to the Traveler List but they won’t show up immediately. Nation-Wide Tour – unlocked when the Komon Combo is created? Ako Clan Samurai – I got these guys after I reached 30,000 Yield and unlocking the Samurai House (for research). Friendship Alliance – unlocked after Edomae Combo is created? Prince’s Secret Tour – ??? Pumpkin Products PR – unlocked from Traveler combo? Gas Survey Tour – unlocked after obtaining the option to research the Elekiter Shop? New Home Search Team – Have a total of 3 Zoos (anywhere on the map). Kairobot’s Journey – unlocked after placing all 46 unique combos on the map and reaching 50 years. A reason that residents aren’t making money is that they could be too far away from the Wholesaler, Castle, or field. The walking range of residents tends to be between 9 – 14 squares. Keep this in mind when you’re placing vacant lots on the map to ensure that they’re not far from a source of income. A horse or a car will increase the maximum distance they can reach so invest in constructing a Stables or two when you get the chance. Note: walking range also factors into whether or not residents can purchase a horse so if the Stables are too far from their homes, they won’t be able to buy a mount. 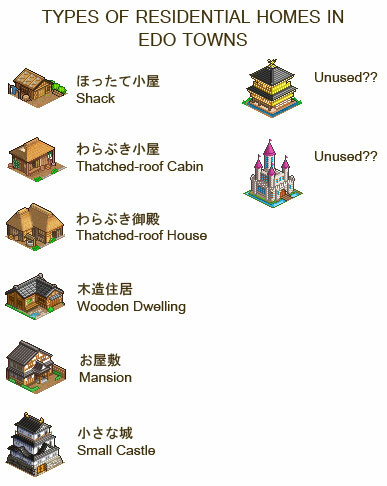 For the first four types, the official translations are Hut, Thatched Hut, Thatched House, and Wooden House. House upgrades are based on savings (re: how much they have in their wallet) and the type of path near their houses. In terms of paths, a Gravel Path is needed for both the Wooden House (dark brown house with black roof) and Mansion. To get the Small Castle, a Stone Path should be near the home. Upgrade to Thatched Hut: 20G? Upgrade to Thatched House: 30G? Upgrade to Mansion: 60G – 80G? Upgrade to Small Castle: 80G – 100G? For the most part, the profession the resident is in affects the amount of money they make which means that the Mansion and Small Castle are more likely obtainable by the Warrior and Vassal.